Awen are thrilled to announce the launch, on 17 January 2019 at Blackwell’s Bookshop, Alistair McNaught’s long-awaited novel The Tragicall History of Campbell McCluskie. 48–51 Broad Street, Oxford OX1. Free admission. On Wednesday 5 December Awen was delighted to host the launch in Stroud at the ever-wonderful Black Book Café of two of our newest books. These were Green Man Dreaming: Reflections on Imagination, Myth and Memory, Lindsay Clarke’s selected essays; and By the Edge of the Sea, a short story collection by acclaimed New Caledonian author Nicolas Kurtovitch, translated into English for the first time by Anthony Nanson. Lindsay travelled up from Somerset to join us – and Nicolas beamed in from what was for him the following morning in New Caledonia, which is 11 hours ahead of Great Britain. Last minute hook up with Nicolas as Richard starts the event! Thank you, Glenn! There was a nervous few minutes while we waited for Nicolas to appear on the skype call that our good friend Glenn Smith had set up for us – after all, when we called Nicolas it was only 6.30am! But, bang on the dot of 8pm our time he appeared, ready to share a virtual coffee with us. Anthony then interviewed Nicolas about New Caledonia and its situation in the world – poised between Australia, New Zealand and Papua New Guinea – Nicolas’ inspirations for his long writing career, and particular for this writing collection. He spoke about how he had gone to live on Lifou, an island off the main island of New Caledonia, among the Kanak, the indigenous people, and how the landscapes and people he knew came into his stories – and how he wanted to share his relationships and personal experiences with the world, to bring the lives of the Kanak into a wider view. At that time in the 1990s, New Caledonia was just emerging from a period unrest following a failed bid for independence from France – ironically, just weeks before the launch of this collection in 2018, there had been a referendum on whether to stay part of France or become an independent nation. This time, the New Caledonians voted to stay – but not as many did as was assumed. Here’s a clip of Nicolas talking about inspiration from Australian travels – apologies for the sound quality, he’s coming from a long way away! Then it was time for Lindsay, ably introduced by our emcee for the evening, Richard Selby, who runs the story, song and poetry night, What a Performance!, in Bath. More readings followed, going into dreams, and back out again, via the I Ching, and into his novels, The Chymical Wedding and The Water Theatre, and back to the personal. We’ll be sharing some of this on the blog at a later date. Then there was time for a question and answer session – and the all important book signings! Putting on a launch event is always very much a collective effort, so we’d like to say our thank yous! Of course, big thanks are due to Lindsay and Nicolas for joining us and sharing their thoughts to create a meaningful, warm, fascinating evening. Thanks also go to our hosts Black Book Café for providing such a warm and welcoming atmosphere … as well as coffee and cake! Thank you to Richard for the excellent emceeing, big thanks to Glenn for coming down and making the tech happen for us, thanks to Kirsty for managing the book stall – and, of course, to the audience! We’ll see you at the next event! On Wednesday 5 December, Awen has a launch party in Stroud for two new books – at the Black Book Café, Nelson Street. 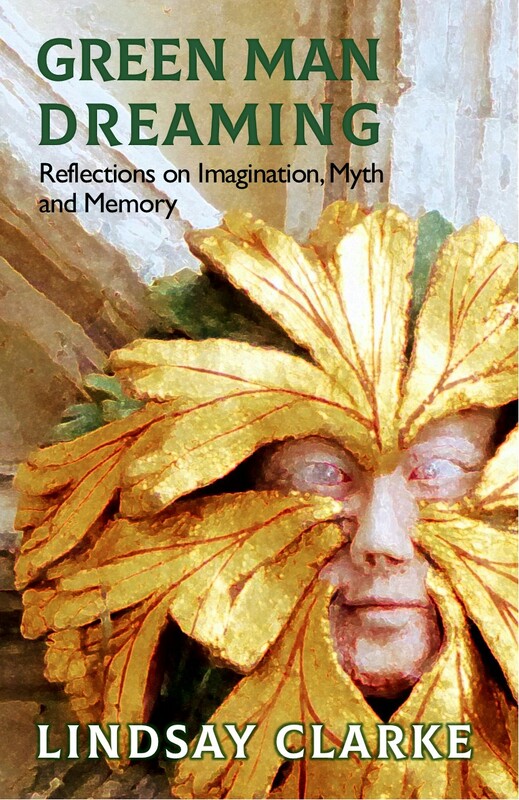 It’s a free event; doors open at 7.30 p.m. and the talks start at 8.00 p.m.
Green Man Dreaming: Reflections on Imagination, Myth, and Memory is a definitive gathering of Lindsay Clarke’s inspiring essays and talks. Those of his essays which had come my way in past years had a big impact on my life, and I think the same has been true for many other people, so I’m really thrilled that Awen is able to make this amazing body of work available in book form. Lindsay is as inspiring a speaker as he is a writer, so if you’re in reach of Stroud do seize this opportunity to come and hear him. We’re also launching By the Edge of the Sea, a collection of short stories by Nicolas Kurtovitich, one of the leading literary lights of New Caledonia, whom I had the pleasure to meet during a research trip there in 2016. The book was originally published in French as Forêt, terre et tabac. It was a tremendous privilege to translate Nicolas’ gorgeous lyrical prose into English. I will read from one of the stories at the event, but we also intend that Nicolas will be present via skype from New Caledonia and have chance to speak to us. The evening will be emceed by the irrepressible Richard Selby. Please come if you can. Below is some information about Green Man Dreaming. I’ll say more about By the Edge of the Sea in a subsequent blog post. The transformative power of imagination, the elusive dream world of the unconscious, our changing relationship to nature, and the enduring presence of myth – these subjects have preoccupied Lindsay Clarke throughout the thirty years since he emerged as the award-winning author of The Chymical Wedding. Assembled in this definitive collection are the major essays, talks, and personal reflections that he has written, with characteristic verve and insight, on these and other themes relating to the evolution of consciousness in these transitional times. Speculative, exploratory, salty with wit, and interwoven with poems, this book brings the Green Man and the Daimon into conversation with alchemists, psychologists, gods, and Plains Indians, along with various poets and novelists the author has loved as good friends or as figures in the pantheon of his imagination. This lively adventure of the spiritual intellect will take you through shipwreck and spring-water into the fury of ancient warfare, before dropping you into the dark descent of the Hades journey and urging you on to the fabled land beyond the Peach Blossom Cave. Through a reverie of images and ideas, Green Man Dreaming puts us closely in touch with the myths and mysteries that embrace our lives. Chrissy Derbyshire is a master of style – lyrical and accessible, archly ironic, and yet at the same time charged with the sensual feyness of Faerie. The eight stories in Mysteries take tropes from myth and fairy tale and animate them, through the alembic of lived experience, with a potent contemporary spark. The ten poems also included in this collection do the same, in a more focused epiphanic way. In the literary cosmos, Chrissy’s work fits somewhere between Tanith Lee, only with more sense of humour, and Storm Constantine, only more lyrical. Ten years after this book’s first publication, Awen is pleased to release a second edition, including an additional story and three extra poems, with a foreword by fantasy author Kim Huggens and stunning cover art by Tom Brown. You can order Mysteries, like all our books, from the website. This enchanting and exquisitely crafted collection by Chrissy Derbyshire will whet your appetite for more from this superbly talented wordsmith. Her short stories interlaced with poems depict chimeras, femmes fatales, mountebanks, absinthe addicts, changelings, derelict warlocks, and persons foolhardy enough to stray into the beguiling world of Faerie. Let the sirens’ song seduce you into the Underworld. I’m very pleased to announce that the second edition of Karola Renard’s collection of stories The Firekeeper’s Daughter, originally published in 2011, is now in print. It’s not just a collection, and the stories are not merely short stories. These tales may be described as ‘mythic stories’ in the sense that, though the characters and situations are of Karola’s own invention, at the core of each tale is a potent awareness of mythic archetypes – and, in particular, archetypes of the divine feminine. Karola’s concept of ‘firekeeper’ refers to the notion of a lineage through history of women who have a special calling to carry the flame of spiritual hope. What exactly this means in practice varies between different cultures and different time periods. They may be priestesses, they may be medicine women, they may be shamans, they may be mysterious figures who appear for a time from somewhere else and, having touched other people’s lives, vanish back wherever they came from. Maybe, whether you’re a woman or a man, you’ve been blessed once or twice in your life through encountering a woman of this kind. So the twelve stories in The Firekeeper’s Daughter are threaded together by this theme, even though each story involves new characters and a new setting. The tales are arranged in roughly chronological order from ‘Daughter of Ice’, which takes place in a Palaeolithic Ice Age setting, to ‘Orchard of Stones’, set in twentieth-century Germany. One of the book’s elegances from a literary point of view is that the style of each story is adapted to the setting. The earlier stories, set in earlier periods, have the more oral intonation of myth, legend, or fairy tale, and Karola performed some of these tales live as a storyteller during the time she was developing them. The later stories converge towards the norms of contemporary prose fiction; that final story, ‘Orchard of Stones’, is structured as a fragmented narrative that jump-cuts back and forth between different decades. The Firekeeper’s Daughter is a book that can be enjoyed simply as a set of evocative, moving, and varied short stories; but for readers who are interested in the continuing importance of myth and archetype in our lives today, and especially of the sacred worth of the divine feminine, there is a deeper level of inspiration to be found here. As I write (August 2017), Kevan Manwaring is attending Asylum, the huge steampunk jamboree in Lincoln. He’s performing there and also showing off the new editions of three volumes of his epic Windsmith Elegy, a genre-crossing work that Nimue Brown has made a compelling case for regarding as steampunk (among other things). Indeed, back in 2012 Kevan promoted the previous editions of the books with a stage show performed by his Steampunk Theatre Company. The new edition of Volume 1 – the rather less steampunky The Long Woman – came out last December. The next two volumes – Windsmith and The Well Under the Sea – are newly republished and looking very smart in, once again, their Steve Hambidge cover designs. These are the biggest two volumes of the five-book series. Each is self-contained in its own distinct setting within Shadow World, the realm of the dead. In Windsmith, this is an analogue of Bronze Age Wessex, informed by real archaeological finds in that region, tales from Celtic mythology, and the images embossed in the Gundestrup Cauldron. The Well Under the Sea is set in and around the luxurious island city-state of Ashalantë, which conflates the mythology of Atlantis and other ‘lost islands’ (see Kevan’s non-fiction book Lost Islands), and adds into this milieu the ‘lost of history’ – individuals who have vanished without explanation during the history of our own world. A particular case in point is the aviatrix Amelia Earhart, with whom the protagonist, Isambard Kerne, becomes romantically involved. In both books, the detail of world-building involves a back-extrapolation of stories behind the piecemeal relics of antiquity that survive in legend and archaeology; the same kind of impulse that drove Tolkien’s mythmaking. Another thing I love in these novels is their committed exploration, in the course of all the drama and romance, of the pathway of a bard’s development; a theme very close to Kevan’s heart, since, outside his fiction writing, he has himself followed a bardic path for many years. In Windsmith, this has mainly to do with Kerne’s mastery of the Ogham, understood as a system of ‘woodwords’ that can work bardic magic in times of need. In The Well Under the Sea, Kerne learns to train his mind to summon winds, and thence to compose and sing a song that will enable him to fly. As I’ve already hinted, the Windsmith books defy neat genre categorisation; they have elements of antiquarian fantasy, liminal and portal-quest fantasy, steampunk, mythic fantasy. One reviewer referred to them as ‘bardic fantasy’, and this strikes me as a particularly fitting label, given their bardic concerns, which are embedded even in their protagonist’s name, Isambard. I look forward to announcing, soon, the new editions of the remaining two volumes, The Burning Path and This Fearful Tempest.